Thank you very much , Suresh I really understood Web Service now. Thank you very much, It is very helpful. 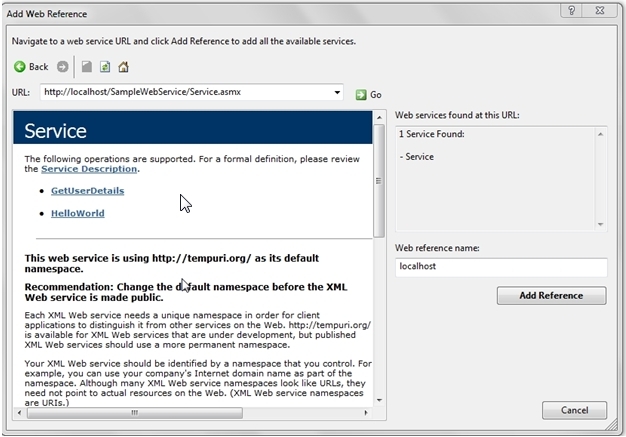 very good article for novice in creating and using WebService.....! How to use this code in windows form to display in datagridview? Please replay. thank you very much suresh . Sir This Artical Is very important to me and my project big problem to solve this artical thanks suresh sir. Hi good article buddy thank. Ultimate,sir ji.A lot of thanks for every blog. Nice Article Suresh, Very Clear descriptions.. Thanks for such breif explanation. I like the article and would like to share it with my frnds as well. i want to more details about WCF & WEB SERVICE. can you tell me why we use  in web service . 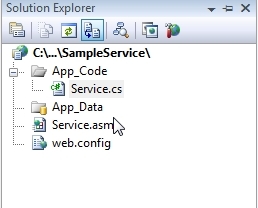 But i want to call the servicemethod from the aspx page it self by Servicemethod="GetUserdetail"
But the created method for the GetUserdetail is taking one argument. I think this is an object!! "Unable to connect to the remote server"
Really your articles are so helpful,,amazing .. Please keep it up Sir ..
Easy to understand for beginners also. I am really thanks Suresh. I am so happy, I had a feared of asp.net.Now I am very clear about it. I know within a few months I am also a programmer in one of the biggest concern. Suresh I never forget you till I die!. thanks .it was of great help. Thanks a lot..suresh now i clear the concept of web services...and your site is so good and nice artical your website is so so so good ...god bless you. thanks.its a great example to understand websevices. it is very useful for beginners. thanks. Just absolutely brillient!!! You are the man!!! Thank you very much for good explaination. Thanks a lot very simple,understandable. Indeed It was Good.But Suppose if we use edmx model in place of manual sql use. 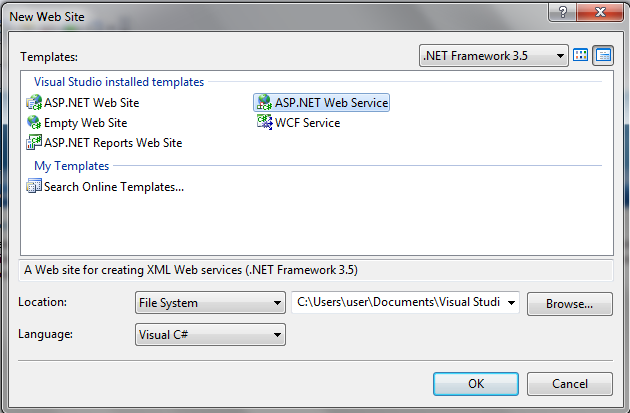 For that if you can give tutorial it will be great..
i did not find asp.net web service in vstudio 2010. Getting time out exception when consuming external web service for the second time. I am consuming it in asp.net web application(c#). Any Help...? Thank You..Its good article, anyone can understand web service easily.. Awesome, Great sample article, post as like this articles, Keep up the good Job. 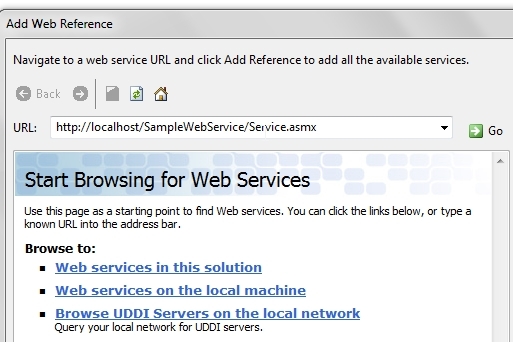 nice example on web service for beginners. Unable to automatically step into the server.Attaching to the server process failed.Access is denied. Wonderful Suresh ! Every time you are describing in this way that's a newly born child also learn. Keep it Up. Also writes articles on WPF,WCF, MVC etc. I copied my webservice published folder in C:\inetpub\wwwroot folder..But in inetmgr m not getting any default website...wat i can do??? Thank you very much for your all articles. Thank you so much sir. I really thought that web services is a hard topic but your way of explaining web services really helps me a lot. Very Helpful for Web Service concept.Thnx Suresh. Plz post simple ASP.Net web login with ms sql data. Nice article , very helpful to me. I'm Raghavendra. I've following your blog from many days and it helped me a lot in my daily project routines. Recently I've got an error in a windows application that I've worked on it earlier. Coming to the point I've developed a windows application in which client has asked to make it demo version for 30 days and later user should buy it from the site. I've did the same. On installing the exe I've created a registry with my application name along with date of installation. Later every time when clicked on exe it will check with the server data to the installed date and checks whether it has crossed 30days. For getting the date I've used a php service and added it as reference. This worked very fine earlier. 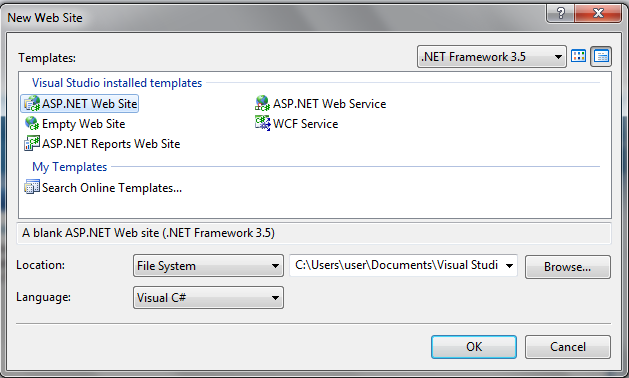 I've added the web reference in my winforms and accessed the method and checked in my application. Please help me in this issue ASAP and let me know the source of the problem whether it is the code or the service?? simple explanation throughout the article. where we will get username in service.asmx.cs file . can u please tell me ? Sir its really good article. Very helpfull to me. Its really useful for me to understand the basic concept of web service. Thank you so much. thanks sir.....such a great work. It's a really good helpful article. Demonstrate authentication and authorization as well please! Super Article Suresh, Very Clear descriptions.Thanks for updating . 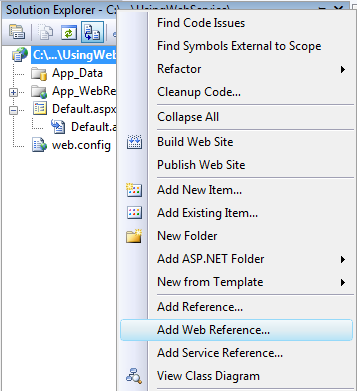 Please can you post articles on MVC concept..
in vs 2012, we didn't get direct option as "add web reference" but we can have "add service reference". In such cases just click on add service reference.. click on advanced button (under the namespace textbox) then click ok. Next window will come then click add service reference. specify URL address of your service. 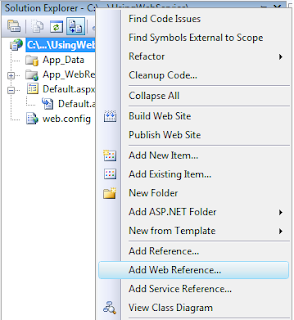 nice article , MVC Sample available? Can u explain what is localhost in the above code. Plz any one help me. i was stuck their. it is very good article provided by you .